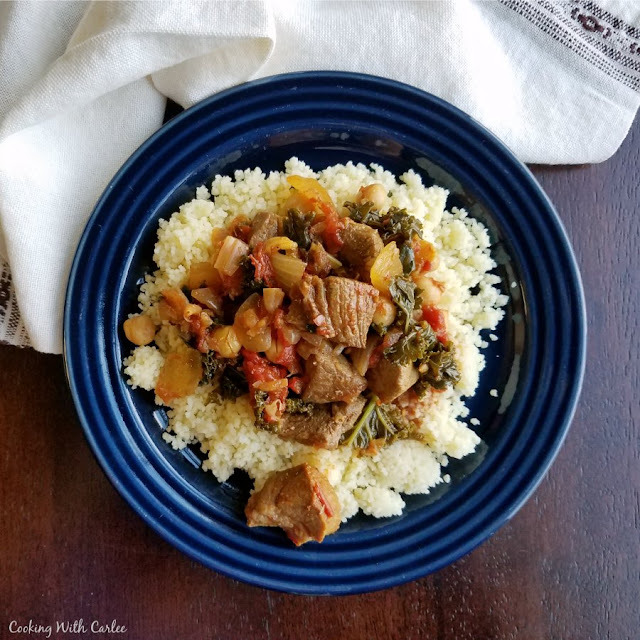 Moroccan Lamb Stew is hearty, flavorful and warm. It is perfect nestled on a bed of couscous and is sure to leave you full and satisfied. This stew is so full of flavor! The lamb is the perfect foil for all of the Moroccan spice. This is a perfect warm you up kind of meal that we enjoy all fall and winter long. I love how hearty it is and that it is relatively simple to make despite the big flavors! I had to buy a whole leg of lamb when I made Maw-maw's lamb curry, but we didn't need to use the whole thing for just the three of us. So, I thought this would be a super tasty way to use the rest. It is warm and hearty but is really easy to throw together. It cooks for a while to ensure tender meat, but is hands off for most of the time. Everyone who ate it went back for seconds. It also stretches the lamb, so it is an affordable way to feed lamb to a crowd. It is always fun to experiment with different flavors. I thought this mix of spices really worked well with the lamb. I added a some more garlic to the couscous as it was cooking and it was so good with a little of the tomato sauce from the lamb. Lamb isn't something we eat very much. In fact, it is hard to get in our neck of the woods most of the time. But we really enjoy it when we do get our hands on some. I am definitely going to have to get some more and do some other stew variations soon and possibly a roast leg of lamb too. Do you make lamb often? What are your favorite ways to fix lamb? 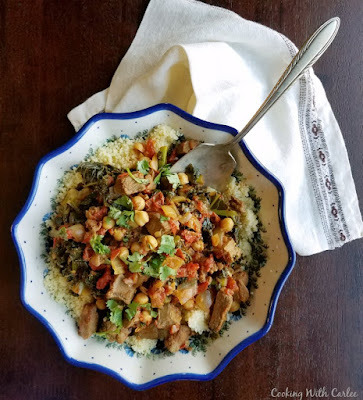 The Moroccan Lamb Stew is hearty, flavorful and warm. It is perfect nestled on a bed of couscous and is sure to leave you full and satisfied. Heat a thick bottomed large pan on the stove (I of course used my trusty cast iron dutch oven... I love that thing!). Brown lamb on all sides. Bring to a boil and then lower to a simmer. Cook with no lid until reduced by 1/3. Then cover and continue to cook for at least 45 minutes. Add beans and greens. Cook for about 10 minutes or until beans are warmed through and greens are wilted. If this doesn't warm you up on a cold and snowy day, I don't know what will! This sounds delicious. I've never eaten lamb, and I've never heard of Couscous. If I can find the latter, I'm going to try it. Thanks for sharing on Sunday's Best. You should! Couscous is basically little balls of pasta. Around here it is normally in the same spot in the store as the rice. We have it as plain and in flavored mixes like the rice. Yet another delicious recipe! I have found memories of eating Moroccan food with some friends of mine many years ago. Thanks (again) for sharing this recipe at Inspire Me Mondays Link-Up! Oh, this would make my hubs so happy! Pinning to make! It is worth it, that is for sure! I hope you enjoy it! This looks amazing. It is featured this week on Funtastic Friday. Hope to see you again this week. Oh, that needs to be pinned. I'm starting to collect lamb and goat recipes. I hope you love it! I am not sure I have ever had goat, but would love to try it! Hi Carlee! This sounds wonderful. I love lamb and reminds me I need to make my lamb ragu. Might to give this a try instead. Glad you are joining the team at Throwback Thursday. Thanks, Quinn! I am really looking forward to joining you on the Throwback Thursday team! We really love this recipe. I need to make it again soon and get some updated pictures! Hi Carlee, a little late, but I wanted to comment on how good this looks! Thanks for sharing this with us on Throwback Thursday and welcome to the team! Thank you, I am so excited to be a part of the crew! I love this recipe! Nothing like a hearty stew in the cooler weather! I agree! It fills you up and warms you up! Now that I think about it, I don't think my daughter has ever tried lamb. This is the perfect opportunity! This will be a fun way to introduce her! You won me over with the Garbanzo beans. I'm thinking that I need to get some lamb and try some of these lamb recipes. I grew up on a beef and dairy farm - no lamb. I have actually never cooked lamb. We don't have lamb often, but it is fun to change it up every once in a while! I love garbanzos too! Now you're talking my language :) I love lamb! What a hearty, comforting dish perfect for the season. I don't use lamb nearly enough! I need to try more. Thanks, Jas! It looks so good!! Definitely wholesome and hearty! Also,so perfect for the fall and winter weather! It is perfect for this cooler weather. It warms you up and fills you up! Thanks Deepika! I am not a passionate lover of lamb, but your recipe seems finger-licking! I'll definitely prepare it for my family! Lamb is a meat we don't do much, but it is fun to something a bit different every now and then! I hope you enjoy it! I love the recipe, but I would love to use pork instead of lamb, is that ok? I think pork would work. It doesn't have the same deep flavor as the lamb, but it would still go really well with these flavors I think. You'll have to let me know how it goes! 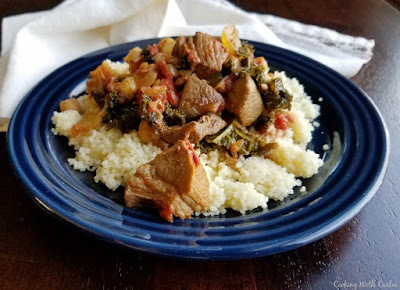 I love lamb prepared with North African spices! Thanks for the recipe. Me too! They go so well together! Thank you so much! I think I would really enjoy this. I am going to a different/bigger grocery store today or tomorrow, I have to check and see if they have lamb. Hi Carlee, this would cook nicely in the slow cooker. Any lamb apart from cutlets is hard to find here (unless it's Easter!). The ingredients are ones I have, so I am going to try this recipe with beef very soon. I think you're right, it would be perfect in a slow cooker! Beef would be a great substitution. I hope you enjoy it! 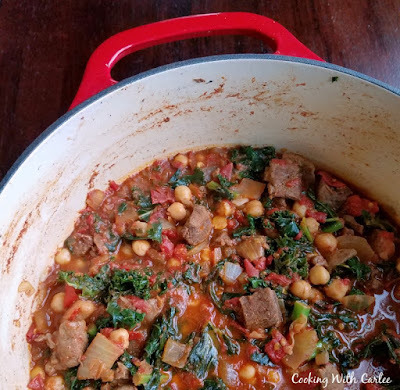 I love lamb and would really enjoy a bowl of this delicious stew! Thanks so much for sharing your post with us at Full Plate Thursday! Have a great week and come back to see us real soon! This looks amazingly yummy - so perfect for the cold weather. It is definitely hearty and warming, perfect for the fall and winter! Thanks, Amy! Oh yum, this looks amazing! Pinned it--thanks for linking up! Hi Carlee, this sounds like a good slow cooker meal. My favourite kind of cooking! The spice mix sounds good, although I'm going to try it with beef as lamb is so expensive at the moment. I think that's a great idea! I should try it that way next time too, beef is a lot easier to get my hands on!